Treasure Beach is a series of small fishing villages along a string of bays: Great Bay, Calabash Bay, Frenchmans Bay and Billys Bay. Until recently, fishermen built their canoes from hollowed out cotton trees and waterproofed the vessels by painting them in distinctive colors. Some of the old canoes can still be seen on the beach. The design is that of the Amerindian Arawaks who settled in Jamaica from about 500AD to 800AD and the only modern change is the replacement of sails and oars by outboard motors. Bay beaches are separated by rocky headlands where crabs scurry in tide pools populated by chitons and an assortment of small sea creatures. Schools of fish, dolphins and sometimes sea cows (manatees) can be viewed from the rocks. They are called sea cows because these huge marine mammals graze on the shallow, grassy sea beds. Moray eels and spiny lobsters hide in the nooks and crannies of the rocky places and the nearby reefs are colored by purple sea fans and orange sponges. Unfortunately, much of Jamaica's marine life has dwindled over the past half century due to overfishing and Hurricane Gilbert damaged many of the shallow reefs around the island in 1988. The Treasure Beach area is ideal for long solitary walks. The Great Pedro Bluff can be reached from the beach at Great Bay by following the tracks used by fishermen and goats. It is a dry scrubland that possesses a desolate beauty. Golden sunsets and the gentle rhythm of waves caressing the shore make walks along the beach a sybaritic pleasure. More strenuous walks are possible in the hills beyond Treasure Beach where the roads climb to Southfield and the Malvern area along the southern ridge of the Santa Cruz Mountains. On a clear day, the views are particularly lovely because they capture the coastline for as far as the eye can see. The highest peak as well as small caves are located on the campus of Munro College, an old English boarding school for boys where students are happy to show visitors around and to regale them with tales of 'Spooner' and other legends dating back to the days of slavery and the time when Munro was a coffee plantation. Lover's Leap is located where the Santa Cruz Mountains plunge to the sea. There are many stories as to how it got its name. The newer version describes slave lovers jumping over the cliff so as not to be separated. However, an 85 year old man who was born in the area tells of a girl who watched her lover sail away. The sheer 1600 ft cliff overhangs the sea and she thought she could join him by jumping off into the water! The view is as stunning today as it must have been when the legends were first created. There is now a small charge for visiting this breathtaking spot beside an old lighthouse. If the gate is closed, ask around for the gatekeeper who will admit visitors even though the restaurant may be not be open. There are stairs on the side of the building nearest to the lighthouse that lead to an upper deck where the jagged coastline becomes visible, stretching from Port Kaiser to the Great Pedro Bluff. The Turkey Vulture (Cathartes aura), known locally as the John Crow, makes its nest in the hollows and ledges of this cliff at Lovers Leap. There is nothing physically attractive about these bald, red headed scavengers with fearsome hook-tipped bills and massive, hunched shoulders. But when they frolic in the draughts of air currents that travel up the side of the cliff, their 6 ft. wingspans impress with an effortless, soaring grace that is contrary to their clumsy mobility on land. For the energetic, there is a 3 mile trail down to a narrow strip of beach where swimming is dangerous due to the depth of the water and the strong currents. On returning to the main road, there is a beautiful stone church that serves this small community. It is typical of the 19th century stone churches that are found all over the island that has more churches per square mile than any other country in the world. 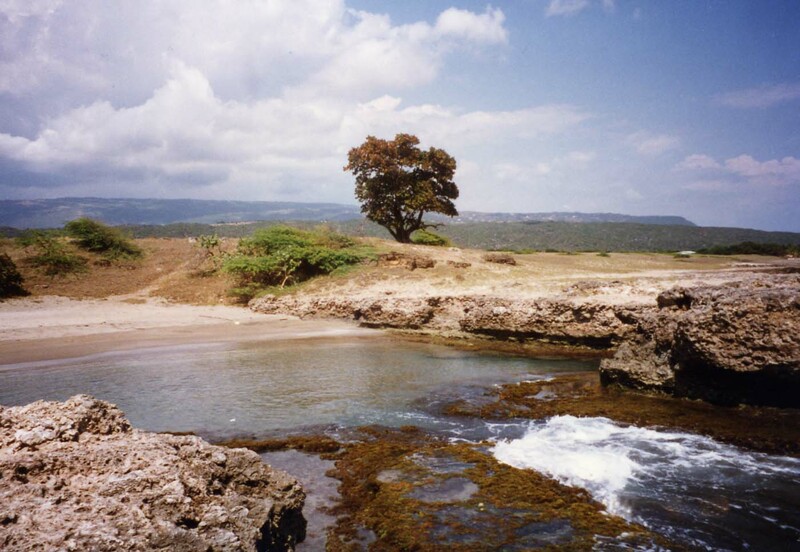 The Black River is Jamaica's longest river. Its name refers to the darkness of the river bed that has been lined with thick layers of decomposing vegetation. It begins as an underground stream in the Cockpit Country and emerges north of Siloah on the southern border of the Cockpits. At Maggotty, the river runs alongside the road where it is convenient to explore its banks and to view the many small waterfalls and the Black River Gorge. The vegetation is dense and overgrown in places but the Apple Valley Park maintains a cleared trail to the gorge and will also provide a guide. To the south of Maggotty past Newton, the river flows into the Upper Morass where the waters merge with those of the Smith River and other smaller tributaries. It is dominated by thick rushes and is easily explored by canoe. Sugar cane is grown on the land to the north of the Upper Morass where the fertilizer and pesticide run off has polluted the river. In the Elim area, a tasty variety of African perch known locally as the Jesus fish is being cultivated to help combat the overfishing of Jamaica's coastal waters. Its local name refers to the miracle of the multiplication of fishes because it is a prolific breeder. Also found in these swamps is the Jesus bird, a jacana that wades among the floating leaves of aquatic plants giving the impression of walking on water. Jamaican colloquialism is uniquely descriptive and frequently imbued with biblical references. After passing through Lacovia, the river flows into the Lower Morass, the largest (14,085 acres) swamp environment exhibiting the greatest biodiversity in the entire Caribbean. The river merges with the waters of the YS River near Middle Quarters, an area well known for its crayfish that is sold at roadside stands as hot pepper shrimps. It is in this region of the Lower Morass that shrimp fishermen can be found tending their trap baskets that are similar in design to those still used by fishermen on the Niger River in Africa and brought to the island by slaves over 300 years ago. Upriver, the YS Falls are a delightful contrast to the somnolence of the Lower Black River. The cool, clear water rushes over three levels for 120 feet to form one of the largest and prettiest waterfalls in Jamaica. Large pools at each level allow for a refreshing swim and are accessed by stairs alongside the river. The Lower Morass supports a rich environment of shallow estuaries, marshland and mangrove swamps. This wetland habitat serves as a hatchery for many species of fish in their juvenile stages, provides a nesting area for various birds and generates an abundance of nutrients for bottom feeders like crabs and lobsters as well as fish such as mangrove snapper, snook and mullet. Swamplands are also helpful in absorbing the shock of tidal waves caused by hurricanes and protect the inland areas. Saltwater crocodiles are among the larger predators in swamps and were once plentiful here but the population has been greatly reduced due mainly to loss of habitat. Their nesting places are being destroyed by heavy draining of the swamps for agriculture and the relentless development of beach areas. Birds are numerous, especially egrets, herons and ospreys. But most intriguing are the mangrove trees themselves because they send out aerial roots like spiders' legs, sometimes dropping 40 feet into the river! One of the most photographed places in Jamaica is the 2 � mile long Bamboo Avenue located between Middle Quarters and Lacovia. Stands of bamboo growing alongside the road form a green, feathery tunnel that flutters with the slightest breeze. It was once much denser but nowadays, the sun peeps through at the top of the arch and at the sides in places where hurricane damage has thinned the stands. 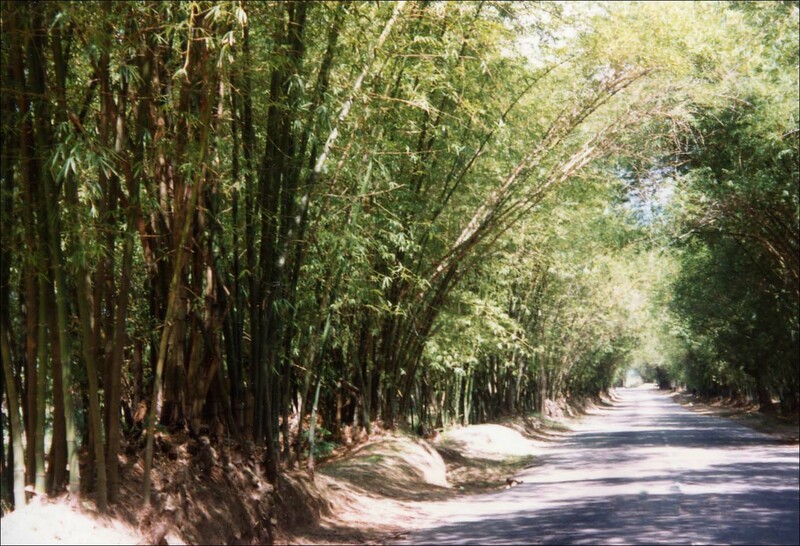 However, bamboo walks have been planted in Jamaica for a long time and Bamboo Avenue is unique only by its length and the fact that a paved road passes through. Most are found in mountain areas where they were established to preserve the dirt roads. They were constructed by placing lengths of bamboo alongside the road. Young shoots sprang up at every joint and they eventually grew to about forty feet high providing shade for the traveler and protecting the road from erosion and the wear and tear of traffic. Bamboo walks can be identified from a distance on the mountain sides where the lighter green color of the bamboo walk zigzags against the darker green of the forested slopes. Visitors are discouraged from using these mountain paths because local ganja (marijuana) farmers control many of them. The southwest corner of St. Elizabeth is one of Jamaicas undiscovered gems. Scotts Cove, noted for roadside vendors selling fried fish and bammy (a flat cassava bread), marks the border between Westmoreland and St. Elizabeth. 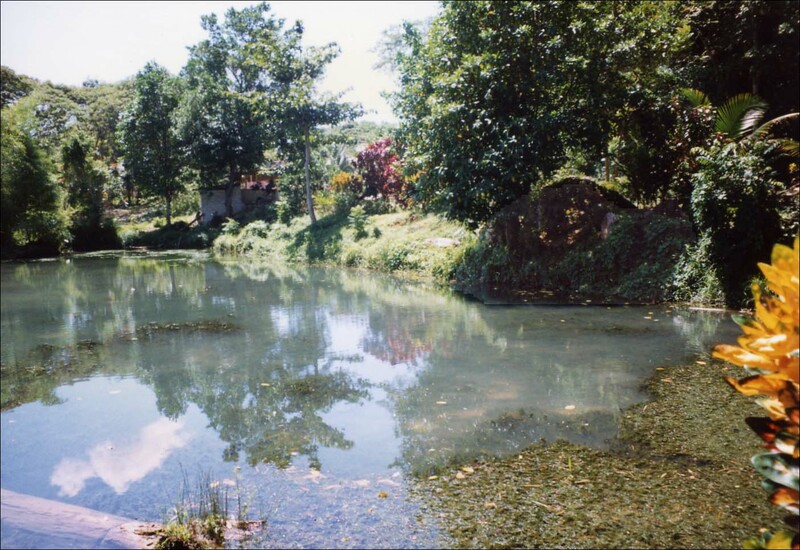 The area on the St. Elizabeth side of Scotts Cove is called Fonthill and was one of the twenty-two estates in Jamaica owned by the Beckford family. For a century, (roughly 1700-1800) this family was one of the wealthiest West Indian landowners but little of the money remained in Jamaica. An heir, William Beckford, squandered his inheritance on various projects including the construction of the Gothic Revival Fonthill Abbey in Wiltshire, England that collapsed in 1825. Unlike his sugar plantations, Beckfords Fonthill was used for cultivating pimento and logwood and raising cattle. The grassy scrubland of the coastal area was ideal for cattle ranching and sturdy, fast-growing acacia trees provided shade for the animals. Logwood trees can still be found scattered around the property. European demand for logwood was high in the 18th century because it yielded a rich range of dyes from red-purple to orchid-blue and black. The Spanish identified the indigenous pimento tree in 1509 but it was almost two hundred years later before its dried berries were first marketed in London as allspice. At Fonthill, pimento trees grow in the hills behind the narrow coastal strip where cattle still graze and goats wear cumbersome wooden collars to prevent their escape through the barbed wire fence. 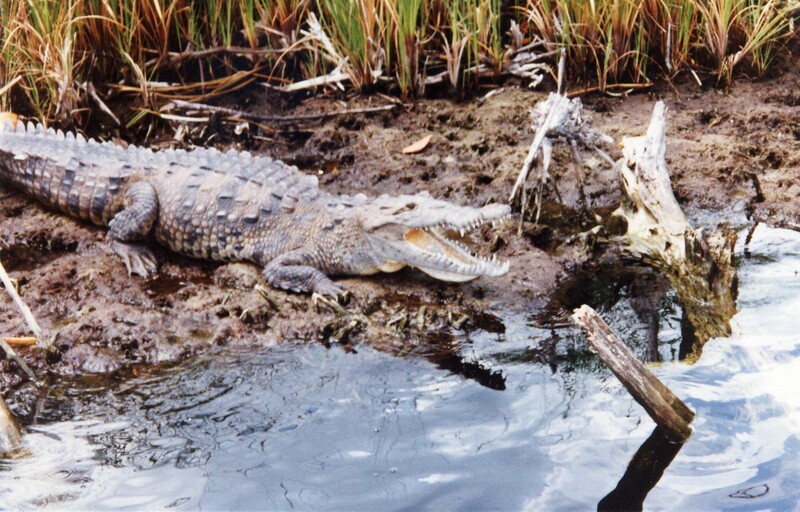 The Fonthill Wildlife Sanctuary includes a coastal mangrove preserve to protect the locally endangered American crocodile. They are best viewed early in the morning and a warden is available to accompany visitors to their favorite sunning spots. Birds are plentiful here. While privately owned, Fonthill was a popular hunting site for 'bird shooters' whose preferred game were the pigeons and doves from the Columbidae family and especially the Bald Pate that makes its nest in the pimento trees on the property. They feed on the ripened pimento berries and sea grapes that grow along the narrow, golden sand beach. Cattle egrets are plentiful around cattle ranches where they can be seen eating the ticks off the animals. In the evening, they roost in the nearby mangrove trees in such great numbers that the trees become a mass of white. Other water loving birds found here are black-billed whistling ducks, lunate bluewings, jacanas, herons and pelicans. The little beach at Fonthill is a delight and can be followed all the way to Luana Point where a lone mangrove tree defines the western edge of the morass that stretches eastward to Longacre Point. 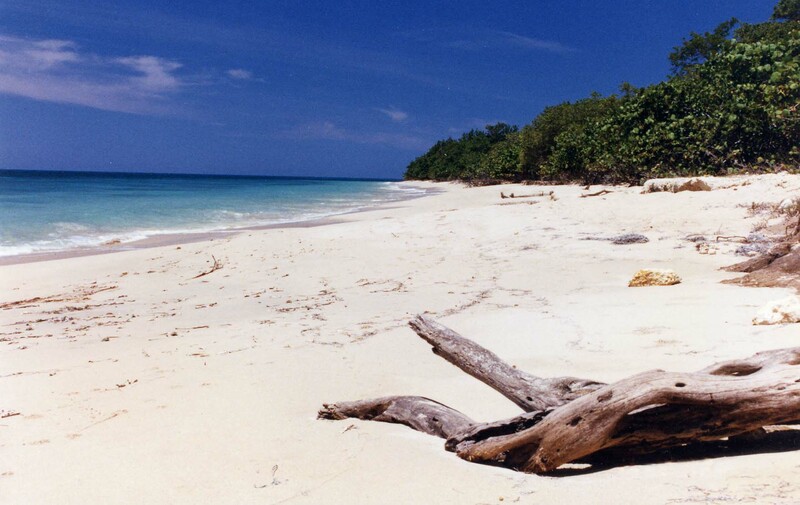 On the eastern side of this swampland is a pristine white-sand beach that must be one of the last undeveloped beaches on the island and unknown to most Jamaicans. This idyllic spot boasts turquoise water and shallow reefs. The local name of this beach and directions to get there will not be provided because there is enough information here for those who are interested in finding it. Winter months are cooler and generally drier. Summer months are hot but this is tempered by offshore breezes and/or afternoon rains that cool off the land. Rivers are fuller and the land more lush. Snorkeling is best from April to October while exploring the swamps is more comfortable from November to April. The closest international airport is located in Montego Bay. The sights of St. Elizabeth are best accessed from Mandeville or from Treasure Beach. Whether driving or taking public transportation, a reliable road map of Jamaica is essential because all the areas described here are reached by secondary roads. Bring comfortable clothing, good walking shoes, swimming apparel, a light jacket and pants for cool evenings in the mountain, a hat with a brim, suntan lotion, a water bottle and insect repellent that is needed for beach and swampy areas. Organized tours of St. Elizabeth can be arranged at most hotels around the island. However, the area is especially noted for its hospitality and exploring from the freedom of your own vehicle provides one of the best opportunities for getting to know Jamaicans. Driving by a farmer's home in Southfield, we saw a pile of watermelons in his carport and stopped to ask if we could buy one. Not only were we offered one which we shared with his family, but we were also treated to a tour of his five acre farm, a fascinating discussion on mulching (they use guinea grass that is very effective in retaining moisture), and two hours later, we were on our way with another watermelon and one of the last cantaloupes. While we cannot guarantee gifts of watermelons, we do guarantee that you will make new friends. The pace is so sedate that driving is not as intimidating as it is in other parts of the island. An alternative to driving is to negotiate a tour with a local driver. Public transportation is not a feasible option for the faint of heart or for those with tight schedules. Most buses lack air conditioning and do not adhere to a rigid schedule. They depart when they are full and the ride itself can be a terrifying experience especially when traveling along curvy mountain roads. Surprisingly efficient and inexpensive, the bus system is comprised of independent operators who provide service to all parts of the island. Buses to Mandeville and Black River are available from the major towns in Jamaica. Most Treasure Beach buses originate in Black River. Organized tours cost about $200 per person per day for an air-conditioned hotel room, all meals and transportation. Independent travelers who rent a car, eat at local restaurants and stay in small inns and hotels will spend about $100 per person per day assuming double occupancy. For those who travel on the cheap, it is possible to get around on $50 per day per person by utilizing public transportation and taking advantage of B&Bs that cost as little as $30 per person per night. B&B's are rarely advertised but can be found by asking at local stores or gas stations. Carry drinking water at all times. All tap and river water must to be boiled or filtered before drinking. Always take precautions against sunburn. Bring an insect repellent. Your sense of well-being will be challenged by bug bites. Use common sense when exploring and always ask for permission before wandering onto private property. If you are uncertain, local children are happy to help. Remember that in newly developing tourist areas, local people will adapt to their perceived needs of the market. If you express an interest in a wild orchid and your guide offers to pick it for you, take the opportunity to explain that it is better to leave it for others to enjoy. Do not hesitate to eat like local people. Roadside stands at Scotts Cove (fried fish and bammy) and Middle Quarters (hot-peppered swimps) offer some of the best in Jamaican food and good value to boot! Countrystyle is a leading marketer of Jamaica's country life and specializes in providing alternatives to traditional 'sea and sand' vacations. They will make all arrangements for visitors to explore the St. Elizabeth area. Their Countrystyle Bed & Breakfast and Small Properties Programme offers choices ranging from a modest B&B with a rural Jamaican family to an indulgent cliffside villa. Tours are personalized to accommodate special interests or requirements. TreasureBeach.net has the most complete listing of accommodations in Treasure Beach as well as a helpful map. Charles Swaby and Shirley Chung, partners and avid conservationists, offer daily tours through the Lower Morass of the Black River as well as tours to the YS Falls. Rental canoes with a guide are available for the adventurous to explore those areas that cannot be accessed by motor boats. Call ahead for information and/or reservations. South Coast Safaris also offers a one day tour package that includes transportation from hotels in Negril, Montego Bay, Ocho Rios or Kingston, the Black River Safari Boat Tour, lunch and a visit to the YS Falls. Arrangements for this tour package can be made at most hotel tour desks. Jamaica: A Visitor's Guide by Harry S. Pariser has an excellent description of the Black River and St. Elizabeth in general. The Adventure Guide to Jamaica by Steve Cohen describes most of the areas mentioned here. Jamaica: A Lonely Planet Survival Kit by Christopher Baker provides good historical notes on the St. Elizabeth area and also has a generous listing of accommodations in out of the way places for those traveling independently. Tour Jamaica by Margaret Morris is published in Jamaica and features a road map as well as detailed descriptions of a fairly thorough road tour of the island.